The LV3 V6 engine is produced by General Motors for use in pickup trucks. 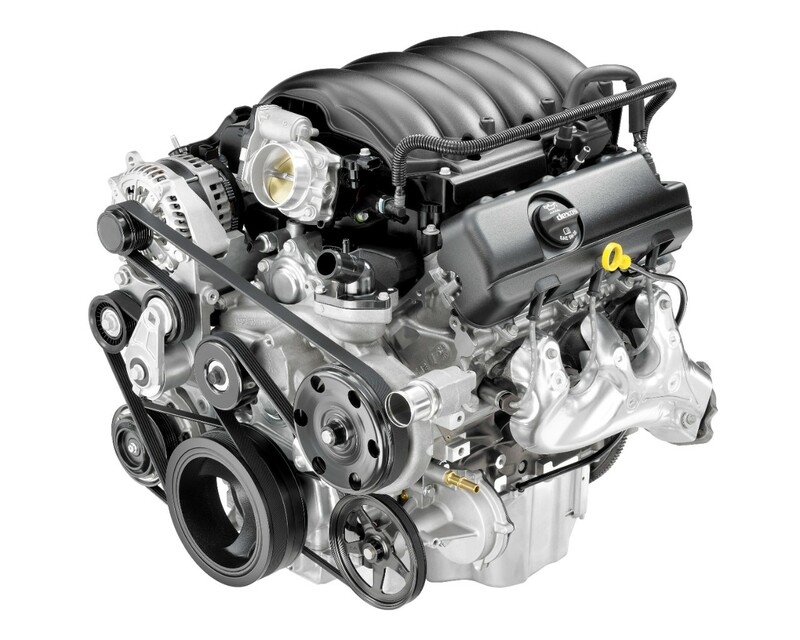 It is part of GM’s 5th-generation Small Block engine design that’s named EcoTec3 in pickup trucks, replacing the 4th-generation Small Block engine family known as Vortec. 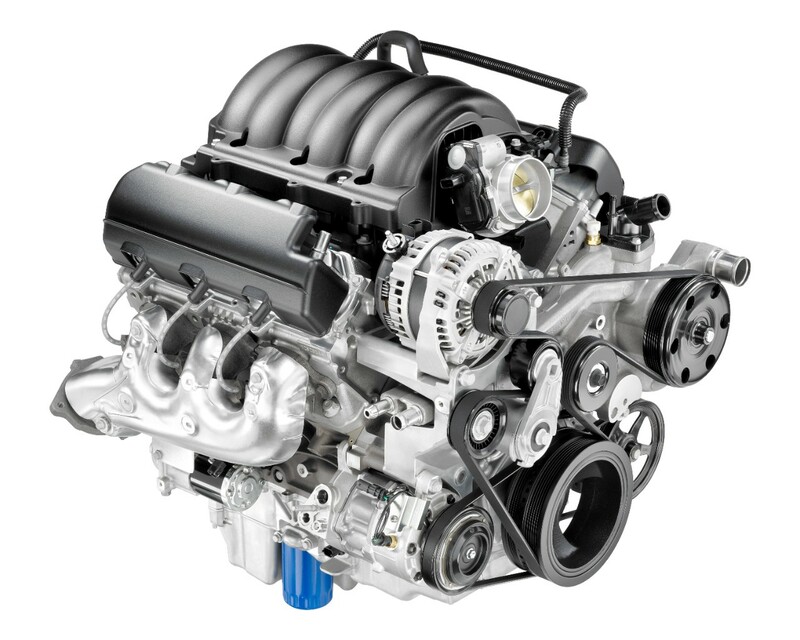 The launch of the EcoTec3 engine line, including the 4.3L V6 LCV, coincides with the launch of the all-new 2014 Chevy Silverado and 2014 GMC Sierra. All three engines are mated with proven, efficient six-speed transmissions in the United States and Canada. Specifically, the LV3 offers budget-conscious customers a state-of-the art truck engine, SAE-certified at 285 horsepower (212 kW) and 305 lb.-ft. of torque (413 Nm) — the most torque of any standard V6. The 4.3L V6 LV3 is based on the V8 versions of the Gen V family, but with two fewer cylinders — a design lineage that dates back to the previous 4.3L V6, which was itself a Gen-II small block with a pair of cylinders removed. Cylinder block: the all-new Gen V cylinder block shares two key design elements with GM’s original small-block V8: a 90-degree cylinder angle and 4.400-inch bore centers. The bore and stroke dimensions are 3.92-inch (99.6 mm) bore x 3.62-inch (92 mm) stroke (262 cubic inches) for the 4.3L. Compared to the Gen IV engine, the Gen V’s aluminum cylinder block casting is all-new, but based on the same basic architecture. It was refined and modified to accommodate the mounting of the engine-driven fuel pump and vacuum pump. It also incorporates new engine mount attachments, new knock sensor locations, improved sealing and oil-spray piston cooling. Oiling System: the oiling system is revised and features a new, dual-pressure-control and variable-displacement vane pump with increased flow capacity. As with the Gen-III/Gen IV engines, the oil pump is driven by the crankshaft. Variable displacement enables the pump to efficiently deliver oil pump flow as demanded. Dual pressure-control enables operation at a very efficient oil pressure at lower rpm coordinated with the Active Fuel Management and operation at a higher pressure at higher engine speeds providing a more robust lube system with aggressive engine operation. All Gen V engines are designed to be used with GM’s Dexos semi-synthetic motor oil. “Thinner” oil is used, too, which helps reduce friction to enhance efficiency. The 4.3L V6 uses 5W30 oil, held in a six-quart aluminum oil pan. Oil-Spray Piston Cooling: all Gen V engines feature oil-spray piston cooling, in which eight oil-spraying jets in the engine block drench the underside of each piston and the surrounding cylinder wall with an extra layer of cooling, friction-reducing oil. The oil spray reduces piston temperature, promoting extreme output and long-term durability. The extra layer of oil on the cylinder walls and wristpin also dampens noise emanating from the pistons. Rotating assembly and windage tray: within the 4.3L’s block is a durable rotating assembly that includes a steel crankshaft and 6.125-inch-long, powder-metal connecting rods, as well as high-strength, aluminum-alloy pistons. The connecting rods have a new profile that enhances strength. The pistons are lightweight, which enhances high-rpm performance, as they enable the engine to rev quicker. They also have a unique head topography that is essential to the direct injection system. The “bowl” and shape of the top of the piston head is designed to promote thorough mixing of the air and fuel – a dished center section helps direct the fuel spray from the injector – to ensure complete combustion, which improves performance and efficiency, particularly on cold starts. The crankshaft in the Gen V small block is located with new nodular main bearing caps – a significant upgrade over more conventional grey iron main caps. Nodular caps are stronger and can better absorb vibrations and other harmonics to help produce smoother, quieter performance. A redesigned windage tray is also used with the Gen V engine, which features a new oil scraper design. This enhances performance and efficiency by improving oil flow control and bay-to-bay crankcase breathing. The cylinder block an main bearing caps maintain the optimal cranksase “windows” that were perfected on the Gen IV engine. PCV-Integrated Rocker Covers: one of the most distinctive features of the Gen V family is its domed rocker covers, which house a patent-pending, integrated positive crankcase ventilation (PCV) system that enhances oil economy and oil life, while reducing oil consumption and contributing to low emissions. The rocker covers also hold the direct-mount ignition coils for the coil-near-plug ignition system. Between the individual coil packs, the domed sections of the covers contain baffles that separate oil and air from the crankcase gases – about three times the oil/air separation capability of previous engines. Camshaft Design: also rotating inside the engine block is a hydraulic roller-lifter camshaft. Compared to the Gen IV small-block, the camshaft remains in the same position relative to the crankshaft and is used with a new rear cam bearing. The camshaft also features an all-new “trilobe” to drive the engine-mounted, high-pressure fuel pump for the direct-injection combustion system. The camshaft specifications for the 4.3L include: 12.7/12.5mm (0.500/0.492-inch) intake/exhaust lift, 193/199-crank angle degrees intake/exhaust duration at 0.050-inch tappet lift and 113-degree cam angle lobe separation. Dual-Equal Cam Phasing: all Gen V engines feature dual-equal camshaft phasing (variable valve timing), which works with Active Fuel Management to enhance fuel economy, while also maximizing engine performance for given demands and conditions. A vane-type phaser is installed on the front of the camshaft to change its angular orientation relative to the sprocket, thereby adjusting the timing of valve operation on the fly. It is a dual-equal cam phasing system that adjusts camshaft timing at the same rate for both intake and exhaust valves. The system allows linear delivery of torque, with near-peak levels over a broad rpm range, and high specific output (horsepower per liter of displacement) without sacrificing overall engine response, or driveability. It also provides another effective tool for controlling exhaust emissions. The vane phaser is actuated by hydraulic pressure and flow from engine oil, and managed by a solenoid that controls oil flow to the phaser. Cylinder Head Design: the Gen V small-block’s all-new cylinder head design builds on the excellent, racing-proven airflow attributes of previous small-block heads and matches it with an all-new direct-injection combustion system. It supports tremendous airflow at higher rpm for a broad horsepower band, along with strong, low-rpm torque. Compared to the Gen IV cylinder head design, the Gen V head features a smaller, 59.18cc combustion chamber on the 4.3L, which is designed to complement the volume of the piston’s dish. The smaller chamber size and dished pistons work together to produce an 11.0:1 compression ratio. The spark plug angle and depth have been modified to protrude farther into the chamber, placing the electrode closer to the center of the combustion to support the direct injection system. In addition to the new combustion chamber design, the Gen V head features large, straight and rectangular intake ports that feature a slight twist to enhance mixture motion. This is complemented by a reversal of the intake and exhaust valve positions as compared to the Gen IV design. The exhaust port shapes are optimized for the new valve locations, with new port opening locations at the manifold face. Large, lightweight intake and exhaust valves are used in the aluminum alloy heads, including 1.93-inch (49mm) intake and 1.56-inch (39.5mm) exhaust valves for the 4.3L. The lightweight valves enable the engine to rev quickly and capably to greater than 6,000 rpm. The valves are held at new, 12.6-degree intake/12.1-degree exhaust angles vs. the Gen IV’s 15-degree angle. Additionally, the valves are splayed to reduce shrouding and enable greater airflow. Valvetrain components include durable valve springs and roller-pivot rocker arms with a 1.8 ratio – the amount of movement on the valve side of the rocker arm in comparison with the pushrod side. And speaking of pushrods, the Gen V small-block features stiffer, larger-diameter 8.7mm (outside diameter) that provide greater stiffness than the previous 7.9mm design. This enables improved high-speed valvetrain dynamic performance. Direct Injection: direct injection is featured on all Gen V engines. This technology moves the point where fuel feeds into an engine closer to the point where it ignites, enabling greater combustion efficiency. It fosters a more complete burn of the fuel in the air-fuel mixture, and it operates at a lower temperature than conventional port injection. That allows the mixture to be leaner (less fuel and more air), so less fuel is required to produce the equivalent horsepower of a conventional, port injection fuel system. Direct injection also delivers reduced emissions, particularly cold-start emissions. The pistons play an integral role in the direct injection system, as they feature dished heads designed to direct the fuel spray for a more complete combustion. Design of this advanced combustion system was optimized after thousands of hours of computational analysis, representing one of the most comprehensively engineered combustion systems ever developed by General Motors. High-Pressure Fuel Pump: the direct injection system features very high fuel pressure, up to 15Mpa (150bar), requiring a high-pressure, engine-driven fuel pump in addition to a conventional, fuel-tank-mounted pump. On all Gen V engines, the pump is mounted in the “valley” between cylinder heads – beneath the intake manifold. It is driven by the camshaft at the rear of the engine. A “soft stop” control strategy for the pump’s internal solenoid significantly reduces the characteristic “ticking” sound of direct injection systems. Mounting the pump in valley, where it is covered by an acoustically treated intake manifold, also helps reduce noise, while also maintaining the tight, compact packaging for which all small-blocks have been known. Expanded Active Fuel Management Operation: GM’s fuel-saving Active Fuel Management (AFM) technology is standard on all Gen V engines and expands the range of operation by more than 10 percent over the Gen IV family. AFM temporarily deactivates two cylinders on the 4.3L V6 under light load conditions – effectively operating as a V-4 – and seamlessly reactivates them when the driver demands full power. When cylinders are deactivated, the engine’s pumping work is reduced, which translates into real-world fuel economy improvements. The transition takes less than 20 milliseconds and is virtually imperceptible. A new dual-mode oil pump enables Gen V engines to engage AFM earlier than Gen IV applications, helping enhance fuel economy. Greater engine power and torque, improved vehicle aerodynamics, lower tire rolling resistance and enhanced integration of the powertrain in the vehicles also contribute to the expanded operation. Exhaust Manifolds: the exhaust manifolds were developed to improve durability and sealing and reduce operational noise. Cast iron was the material of choice for its basic durability and excellent heat-management properties. The manifolds feature saw cuts along their cylinder head mounting flange, which split the flange into three separate sections on the 4.3L, allowing each section to move under extreme hot-cold temperature fluctuations without interacting with, or creating stress on, another section. The cuts virtually eliminate friction on and movement of the exhaust manifold gaskets, helping ensure proper sealing for the life of the engine and reducing the chance of gasket failure. High-Flow Intake Manifold and Electronic Throttle: the Gen V’s intake manifold ports are designed to match cylinder head, while also accommodating the high-pressure fuel pump for the direct injection system, which is mounted in the valley area between the cylinder heads. It is a composite manifold is manufactured with a lost core process to improve runner-to-runner variation and to reduce flow losses. Acoustic foam is sandwiched between the outside top of the intake manifold and an additional “skull cap” acoustic shell to reduce radiated engine noise, as well as fuel pump noise. An electronically controlled throttle is mounted to the intake manifold. It is a single-bore design with a 72mm on the 4.3L and features a “contactless” design that is more durable and enables greater control. Cooling System: the Gen V’s cooling system is redesigned, compared to the Gen IV engine and features a new offset water pump and thermostat. 58X Ignition System: the Gen V has an advanced 58X crankshaft position encoder to ensure that ignition timing is accurate throughout its operating range. The 58X crankshaft ring and sensor provide more immediate, accurate information on the crankshaft’s position during rotation. This allows the engine control module to adjust ignition timing with greater precision, which optimizes performance and economy. Engine starting is also more consistent in all operating conditions. Electronic Power Steering: All Gen V engines have Electronic Power Steering and do not incorporate a conventional, hydraulic power steering system in its accessory-drive system. This enhances both performance and fuel efficiency. 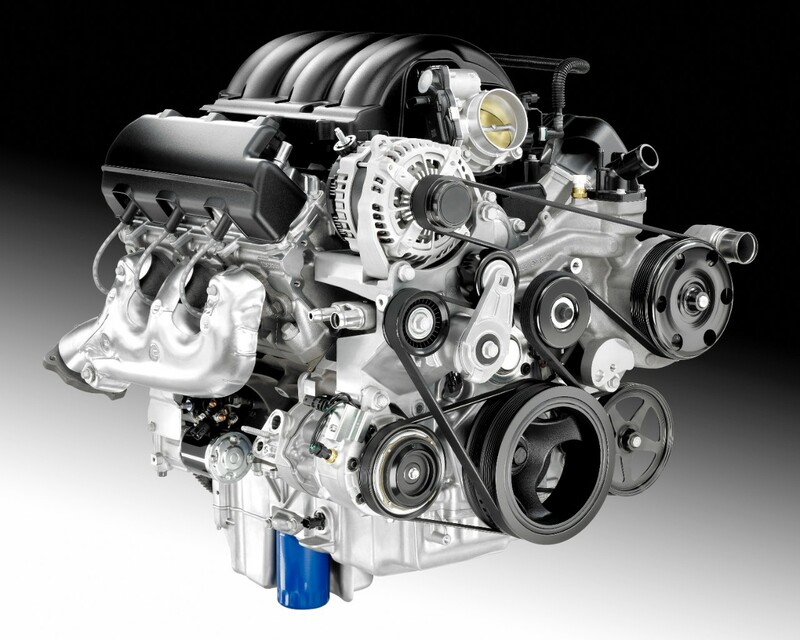 Vacuum Pump: The 4.3L, 5.3L and 6.2L truck engines feature a mechanical vacuum pump to enhance braking performance. It is an engine-driven pump. Air Induction Humidity Sensor: This new feature ensures optimal combustion efficiency, regardless of the surrounding air’s humidity. E-85 Capability: The 4.3L and 5.3L truck engines are E-85-capable, allowing them to run on E85 ethanol, gasoline or any combination of the two fuels. Coil-on-Plug Ignition: The Gen V’s individual coil-near-plug ignition features advanced coils that are compact and mounted on the rocker covers, although they are positioned differently than on Gen IV engine. An individual coil for each spark plug delivers maximum voltage and consistent spark density, with no variation between cylinders. Iridium-Tip Spark Plugs: The spark plugs have an iridium electrode tip and an iridium core in the conductor, offering higher internal resistance while maintaining optimal spark density over its useful life. The electrode design improves combustion efficiency. E92 Engine Controller: operation and performance of the Gen V is overseen by an all-new engine controller.